Welcome to session 43 of the fonia radio show! This time we met with the man behind the labels Karaoke Kalk and Kalk Pets, Thorsten Lütz. Some may know him under his former artist name “Strobocop“. 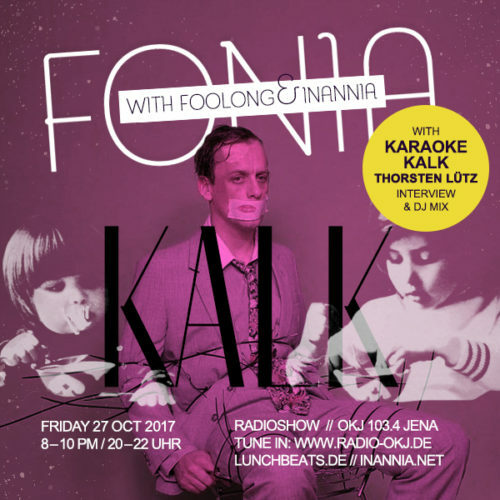 Karaoke Kalk was found in the “Köln-Kalk” district and moved in 2004 to Berlin. Some of the artists on the label are Hauschka, Astrobal, Donna Regina, Bill Wells, Dakota Suite! Listen to an interesting interview and an even more interesting mix set. Be good to yourself! and be good to yourself! We are happy to say that our friend DJ Nature has rereleased his old vinyl “RUFF DISCO Vol.1”. Classic all-time! Check the interview. Here comes the latest version of the FONIA radio show t-shirt. Unbelievably comfy, made from 100% premium organic cotton (only a few of them available). Check it out! Fatplastics Record Store Thats where we go to hunt down the magic black! If you are in Jena, make sure to pay a visit! inannia.net The playground for inannia’s ideas! Radio OKJ – 103.4 The home of our monthly show filled with many friendly people!